“I was referred to Dr. Mazoch by my sister; I knew she would direct me well. It had been 30 years since I had been to the dentist. I had never had my teeth cleaned before and only went to see the dentist when I was in pain. When I was 12 years old, a friend threw a toy gun at me while we were playing, I ducked in the wrong direction and it hit my front teeth. Ever since, if I had to smile I would cover my mouth; for more than 30 years, I didn’t smile. But then those two teeth had eroded so much, they were broken on the side, I was having some pain, they looked awful and food was getting stuck. So, I was motivated to call Dr. Mazoch. I thought that all dentists were good for was pulling out teeth but I was wrong. It took me maybe half an hour to feel comfortable in Dr. Mazoch’s office. The procedures seemed easy and the treatment was definitely comfortable. It didn’t take long to overcome my fear and everything seemed to go rather quickly. I am very motivated to keep things up. I was in deep depression when I first came to Dr. Mazoch, but now she’s given me a reason to smile again! Thanks seems so little to give in return. John S’s two front teeth were unfortunately too damaged to repair, necessitating extraction. A provisional and temporary removable appliance was made during the healing process. His very deep bite (his lower teeth nearly hit the roof of his mouth) made a fixed bridge (crowns with attached false teeth) necessary. We also performed periodontal cleanings, placed multiple fillings, and three individual crowns. John has graciously granted me permission to use a number of photographs of his before and after smiles, including his picture as a 12 year old school boy. 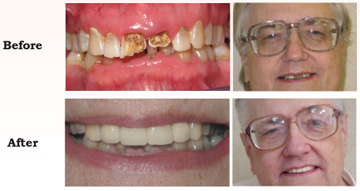 He shows us that IT’S NEVER TOO LATE TO ATTAIN ORAL HEALTH.